Today in Masonic History Daniel Stevens Dickinson is born in 1800. Daniel Stevens Dickinson was an American politician. Dickinson was born September 11th, 1800 in Goshen, Connecticut. At the age of six he moved with his family to Guilford, New York. There he attended common schools and was apprenticed to a clothier. By 1821, he had begun teaching school in Wheatland, New York. He went on to study the law and was admitted to the bar in 1828. After passing the Bar, Dickinson opened a legal practice in Guilford. From 1827 to 1832 he served as the Postmaster of Guilford. In 1834 he moved to Binghamton, New York. That same year he became the first Village President. In 1837, Dickinson was elected to the New York State Senate. He served until 1840. In 1843 he was elected as Lieutenant Governor and served until 1844. In 1844 he was also a Presidential elector voting for James K. Polk. It was also in 1844 that Dickinson was appointed as a Democrat to the United States Senate to fill a vacated seat. He was subsequently elected to a full term in the Senate serving until 1851. The more significant contribution to American politics occurred outside the Senate for Dickinson. Back in New York he became the head of one of the two factions of the Democratic Party. Dickinson was the head of the Hunker faction who were in opposition to the Barnburners. Putting it simply the Barnburners were the progressive wing of the party. They wanted radical and immediate changes to the status quo of the time. More especially they wanted an end to slavery in the Untied States. The name Barnburner comes from the analogy of someone who would burn down their own barn to get rid of a rat infestation. Dickinson, as the head of the Hunker faction was a Conservative and wanted to see more controlled changes made. It is unclear where the term Hunker comes from, it is believed that it comes from a Dutch word. Regardless the word Hunker at the time became synonymous with phrase "stick in the mud." Dickinson would also become a part of the party known as the "Hards" who refused to reconcile with the Barnburner faction after they left the party to join the Free Soilers. 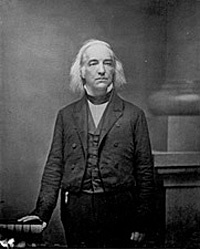 After leaving the Senate in 1851, Dickinson resumed his legal practice. In 1853, Franklin Pierce appointed him as Collector of the Port of New York, but Dickinson refused the position. During the American Civil War, Dickinson supported the Union. In 1861 he was elected as the New York State Attorney General. In 1864 he was appointed United States Commissioner for the final settlement of the Hudson Bay and Puget Sound agricultural claims. It was also in 1864, that Abraham Lincoln considered Dickinson as his running mate. Lincoln wanted to have a pro-war Democrat on the ticket. The nomination went to Andrew Johnson. Dickinson was appointed United States Attorney for the Southern District of New York in 1865. Dickinson remained in his position as U.S. Attorney until his passing on April 12th, 1866. Dickinson was a member Binghamton Lodge No. 177 in Binghamton, New York.